I just love baklava. I have always bought pieces and have been quite happy with my occasional fix. That is until this recipe. 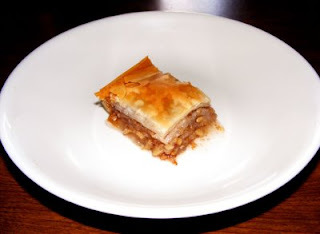 This is the easiest and the BEST baklava I have ever eaten and I hope you agree. Try it and you will be pleasantly surprised! Preheat oven to 375’. Heat 3 cups of sugar and 1-½ cups of water in saucepan. Bring to a boil and boil for 10 minutes. It will be syrupy now. In a food processor combine walnuts or pecans, cinnamon and ½ cup of sugar. Pulse until ground finely. Butter a 13x9 pan. You will have to cut your phyllo sheets to fit your pan. Layer 1 sheet of phyllo at a time. Butter each layer. Once you have 3 sheets place 1/3 of nut mixture. Then 6 sheets of phyllo (butter between each sheet), nut mixture, 6 sheets phyllo (butter between each sheet), nut mixture and then the final 3 sheets of phyllo (remember to butter between each sheet). Cut baklava into 24 squares BEFORE baking!! Bake at 375’ for 30 minutes. It will be golden when you take it out. Pour syrup over baklava. Let syrup completely soak in before cutting. This is soo good!